Following an intense contest in the kitchens of North Shropshire College last Friday (September 9), Pip Davies beat off stiff competition to win the Oswestry Heritage Bake-Off. Oswestry resident Pip was victorious with her impressive assembly of vegan and gluten free bakes depicting ‘Oswestry through the Ages’. The judges, Yossi Gliksman and Margaret Edwards, were also full of praise for the two runners up. They were Louise Taylor-Kennett from Oswestry with her cake ‘Son of Os’ dedicated to Wilfred Owen, and Alex Jamieson from Pant with her bake ‘The Old Market’. 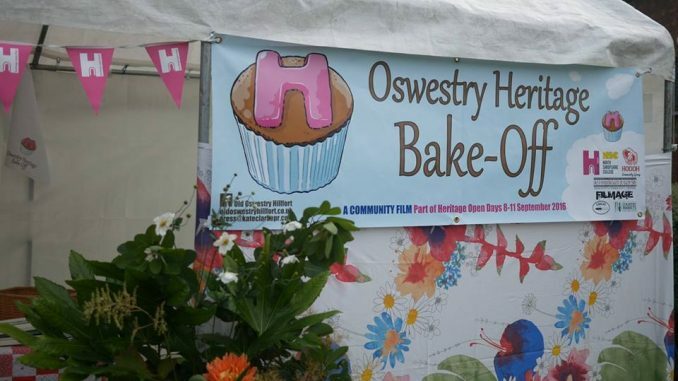 The bake-off was organised by the HOOOH Community Group working with award winning Wrexham based film producer, Joey Edwards of Filmage and associate Bethan Jones. The full story of the two-day heritage challenge is being made into a film to be premiered at the end of November at kinokulture cinema. Staged in a decorative tent on the lawns at the foot of Oswestry Castle bank, the judging on Saturday (September 10) proved to be an eye-catching spectacle during the town’s highly successful Heritage Open Days. Running Thursday through to Sunday, the four-day festival was part of national celebrations organised across the country allowing the public unique access to discover local history. A crowd of relatives and friends watched on in eager anticipation as the winner was announced by the bake-off presenters, Terry and Dru Cripps aka improvisational performers, Pimp$ouls. Oswestry’s deputy town mayor and Shropshire councillor, Vince Hunt, congratulated Pip and presented her with the winner’s bake-off trophy, a specially crafted wooden spoon. He was ably assisted by his daughter, Amber, who gave out bouquets of flowers to the three delighted finalists. Working in the background was an enthusiastic film crew including HOOOH members Neil Phillips, Kate Clarke and Hermon Arts Centre manager Barry Edwards. Giuliana Becciu of the Cambrian Railway Orchard Project (CROP) and Oswestry A-Z initiative dressed the film set and bake-off tent which was generously loaned by Jeff Stote.